Found 3 file extension associations related to Reactis and 3 file formats developed specifically for use with Reactis. 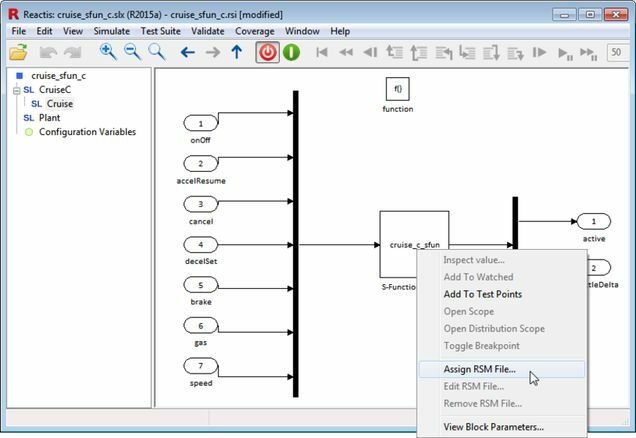 Reactis Tester generates comprehensive test suites from Simulink®/Stateflow® models. The test suites exercise large portions of the software under test while avoiding redundancy, thereby maximizing the probability of finding defects within the time available for testing. The generated tests store model-generated outputs as well as inputs so that test harnesses can automatically check the correctness of source code implementations of models. Reactis Simulator enables users to visualize model execution. Simulator's user interface is similar to those of traditional debuggers from programming languages: it allows users to step through the execution of models by hand as well as set break points. Simulator also supports reverse execution, the replay of tests generated by Reactis Tester, the graphical display of different coverage metrics, and the capability to fine-tune Tester-generated test suites. Reactis Validator automatically searches models for violations of user-specified requirements. If you need more information please contact the developers of Reactis (Reactive Systems, Inc.), or check out their product website.